It's no secret that I am in love with Google Suite for Education. We use Google apps in my classroom everyday and multiple times a day. 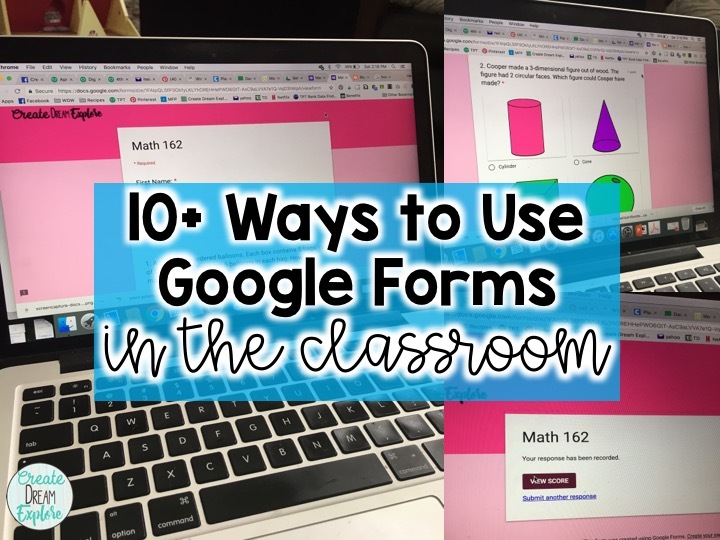 One of my favorite Google Suite tools is Google Forms. There are so many applications for its use. I've listed my favorite ways to use it below. 1. For assessment tracking. Google Forms has an option to create a rubric style question (it's called multiple choice grid). I use google forms for every single one of my assessments. It's so easy to go through and just click the buttons and then add in a comment. I have mine set up using the docAppender add on which allows me to send the form response directly to a google doc for each student. Then you can just print the docs off to send home or share the doc with parents. In my case I have one doc called "assessment" for each student. It's shared with the student so they can check their rubrics as soon as I have them marked. Here's a sample of one of my assessment forms. 2. For behavior tracking: Similar to how I use Google Forms for Assessment tracking, I also use it for behavior tracking. I often have behavior consultants come into my classroom for various students and every single time they ask for the behavior to be tracked using an ABC tracking chart (antecedent, behavior, consequence). It's so easy for me have a form opened on my laptop, chromebook or bookmarked on my ipad. Then I just go through the drop down menus that I have set up for that particular student and I can add a comment if needed. The best part is that when you go to the responses section it shows the data in a graph so you can visually see how often a particular behavior is occurring. 3. Get to know you survey for back to school: At the beginning of the year I always have students fill out a get to know you survey at home with their parents. It asks about how they learn best, their strengths and areas they feel they need to improve on. I send the link via email to parents but you can also send the link on paper (use a URL shortener to make the link simple). 4. Reading Interest Surveys: I also do a reading interest survey at the beginning of the year but I get students to fill this out at school. I ask about how they see themselves as a reader, what genres they like, whether they read at home etc. 5. 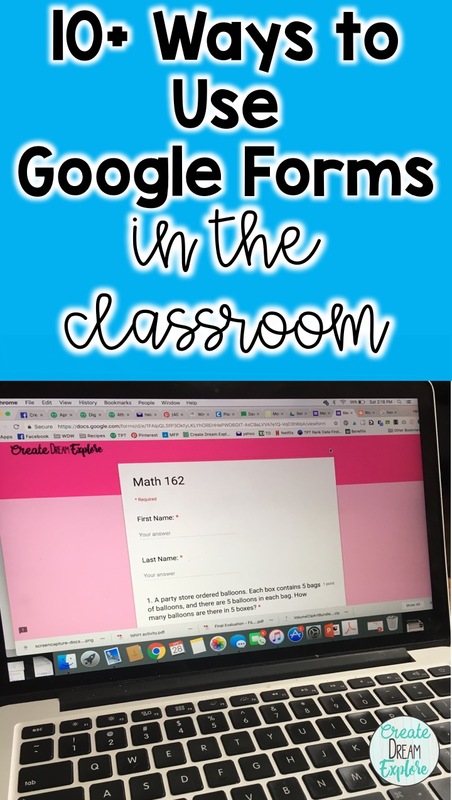 Self-Grading Math Warm-Ups, bell ringers or early finisher work: Using the quiz feature in Google Forms I created recursive math forms for my students. Sometimes I use them at the beginning of the day, sometimes it's early finisher work, or for my split grade class I have one grade working on the math forms while the other is working with me. I'm a busy teaching mom of three littles and these have saved me so much time because they mark themselves! I can quickly use the data in the responses section to see how students are doing. Check out the video below to see one in action. You can find these in my TPT store (click here) and there are full year bundles for 2nd grade to 5th grade. You can get a free sample of these self-grading math warm-ups by signing up here. 6. Google Forms for Quizzes: Google forms has a handy quiz feature that will allow the quiz to grade itself. It's also nice because all of the data is in one place and using the graphs on the response page you can quickly see where your students are struggling. You can create quizzes for any subject. 8. 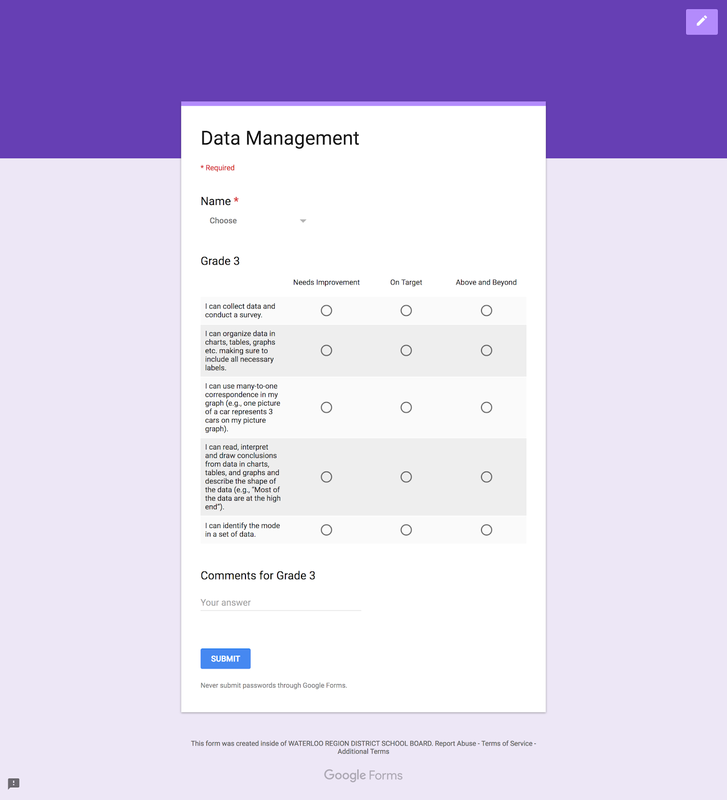 Student created surveys for data management: If you teach math then you almost certainly have had your students create a survey at some point and then graph the data. Google forms are great because students can collect their data and it graphs it form them. Then they can spend more time interpreting the data. My students get really creative with their forms. They love adding picture questions or inserting short videos. 9. Taking Anecdotal Notes: This is along the same lines as assessment. I often have a form that just has the students names in a drop down menu and then the only question on the form says "comments" or I might have an expectation listed as the question and then I just write my anecdotal notes. I use this often for tracking learning skills. 10. For students to demonstrate their knowledge: I often let students choose how they want to demonstrate their learning and creating a google quiz or survey is one of the options they can choose. For example, after a read aloud students can create their own quiz that they can share with a peer. The depth of their questions often shows their understanding of the book. 11. Google Forms for Parent Feedback: At the end of the year you can ask parents questions about how the year went in order to get their feedback. 12: Parent Volunteer Survey: Send parents a link to find out their availability for volunteering as well as what areas they are willing to volunteer for. 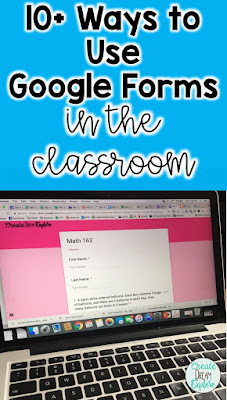 Want to talk more about google forms in the classroom? Join our facebook group for 3rd to 5th grade teachers and ask any questions you have or share your ideas!